Military service: July 1962 – Dec. 1963 – USS Paricutin stationed in Port Chicago California, but deployed to Sasebo, Japan. I left Mary alone in a California apartment and flew away to join my ship. While underway, I witnessed the replenishment of ammunition to aircraft carriers, cruisers and destroyers. It was not what the farm or Central had trained me for, but it was exciting to see 500-pound bombs being transferred by high wire to adjoining ships while at sea. Jan. 1963 – Sept. 1965: After a couple of ship deployments, the Vietnam conflict was requiring additional pilots, so I was accepted and started flight school in Pensacola, Florida. I finished in Corpus Christi, Texas, after finishing aircraft carrier landing qualification. Sept. 1965 – Feb. 1969: I am one of the lucky ones, 58,000 went to Vietnam and did not return. We were assigned to Patrol Squadron 50 stationed in San Diego but were soon flying coastal patrols off the coast of South Vietnam. The two-engine P5 Marlin sea plane with 10 crewmembers we flew required swimmers to remove the wheels when we were lowered from the ramp into the water. While in Cam Ranh Bay, Vietnam, a sea plane tender would provide logistical support for 4 – 5 of our aircraft during operational periods. Fortunately, we soon junked our P5’s and moved to Moffitt Field in San Jose and retrained in the more modern 4 engine P3 Orion aircraft. After another deployment, we moved on to shore duty. Dec. 1969 – Jan 1972: Naval Air Station Willow Grove. Against my wishes I became a Navy recruiter. It was great experience in that we visited colleges in Pennsylvania and western New York. We would give the test for pilot and navigator programs and if applicants qualified, they would come to Willow Grove for processing. Occasionally we were able to give indoctrination rides in the T34 aircraft. Jan. 1972 – May 1975: Back to the P3s in Patrol Squadron 24 Jacksonville, Florida. Jacksonville was great for the family. Unfortunately, we spent two six-month tours in Keflavik, Iceland without family. Flying 10 – 12-hour flights south of the Artic Circle tracking Russian submarines at night at 20,000 feet is an indescribable experience. There was an occasional break when we were assigned NATO training flights into Norway, Great Britain and The Netherlands. 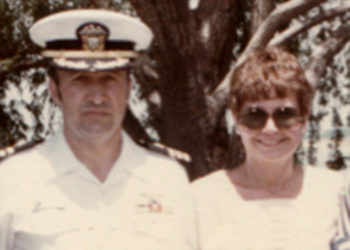 June 1975 – Sept. 1978: Shore duty at Navy Air Station, Glenview, Illinois. Duties here included training reserve flight crews in the P3 aircraft. The weekend warriors did a great job keeping the submarines out of Lake Michigan. Oct. 1978 – June 1985: While stationed at the Naval Air Station in Dallas, Texas, I was assigned to the Aircraft Maintenance Department, where I provided support for reserve F4 squadrons. Additionally, I flew the C-12 aircraft on logistical support flights all over the country. My life now: Retiring from the navy at age 46 with half-pay has been great. I obtained my security license in 2000 and worked briefly for Fidelity Mutual Fund Company for a couple of years. I learned enough to be dangerous as an investor. Our three daughters have successful careers in Texas as a nurse/teacher, real estate attorney and public-school superintendent. I have been so blessed that all I can wish for now is equal success for our six grandchildren ages 12-25. I probably could not survive in this day of increased social media. Without Central, football and the Navy, my life would have been quite different. Our team in 1960 was the last to have a losing season, so I learned humility. Starting with chapel 5 days at 0800 was a discipline that carried over with 0800 morning colors in the Navy. Gene, This from a friend and fellow flight school student, USMC type, in Pensacola, 1964. Flew F-4s for USMC for 6+ years. 253 missions in RVN. Numerous small business endeavors since. Been here in Annapolis, MD area for 25+ years. Lost my Kay in November, 2012. Ain’t fun! Four children, but we lost first son, Brian, when he was 6 years old. Also ain’t fun! Remember Al Branch, John Britt, Rob Smith, etc. The best to you and yours. Blessings. What an interesting career you had, Gene, so different from my own. Because I was in law school, and then had a family that exempted me, I never served in the military. But at one point I was sure I would be drafted and filled out the papers for Army Judge Advocate General service. My younger brother served in Viet Nam and did not enjoy the experience. I, too, appreciate your service. It was people like you that made people like me safe during the Cold War. Thanks for sharing your story. Greetings to fellow alum Gene Chapman! I enjoyed his account and thank him for his service, which could be very demanding apparently. We did lose many great young people in Vietnam. That lost generation might have steered our country in a somewhat different course that that undertaken by those who, for whatever reason, did not serve. Good luck, Gene, and fair sailing (or flying)!